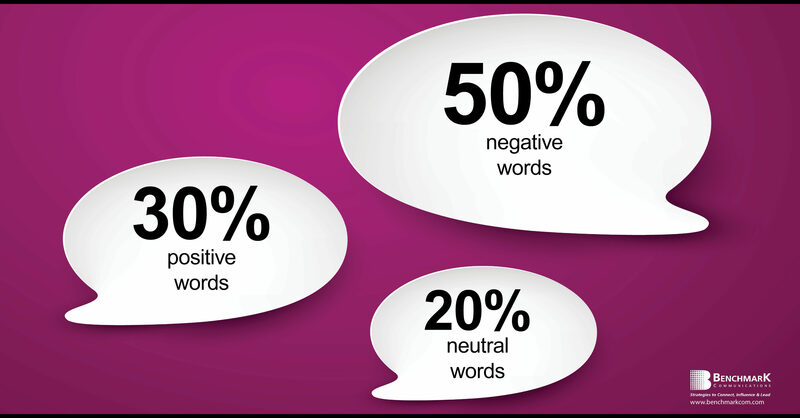 Are you aware of how many negative words you use each day as you communicate? You might be surprised. You might be even more surprised at how your use of negative and positive words impacts your ability to influence others and make good impressions that lead to promotions and greater influence. As you speak, your listeners’ brains are constantly running various “software programs” that either filter your messages in – or out. So, it is important to understand how your words influence other people. 1. Negative words are harder on your listener’s brain – Your words have consequences. You make things much more difficult for your listeners when you fill sentences with negative words. Studies show these word patterns result in the release of negative hormones and neurotransmitters in the brain. 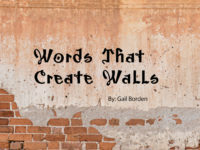 While positive words stimulate the brain’s frontal lobes, negative words trigger increased activity in the amygdala, which is the fear center of the brain. In turn, this can cause a partial shutdown of the reasoning and logic centers located in the frontal lobes. Negative words can make people feel tense, nervous and even fearful as they attempt to figure out what you want and how to respond to you. They can cause people to experience a sense of confusion, defensiveness, conflict and even lowered self-esteem. During leadership communication coaching sessions, we often conduct exercises to show how word choices impact the breathing and neurology of others. We were working with some leaders for a Fortune 100 group and during a break a few of us were talking casually about the pros and cons of drinking coffee. One leader said he liked the aroma of coffee but didn’t like how the darker roasts make him feel heavy and even sick at his stomach. One of our coaches quickly pointed how his words were impacting those gathered. It was true: our postures had dropped, and we felt weighted down. It was an interesting and unintended lesson about the impact of negative words! Your report is confusing & full of errors. Your report needs to be clear & accurate. This is not the correct receipt. Could you give me the correct receipt? I do not want a dark meeting room. I want a meeting room with natural light. There is a time and place for negative language, but the rub is in the overuse of negatives. With awareness of the words you use, you can preserve the intent of your messages and easily turn negatives into positive statements. One of the benefits of being leadership and communication coaches is we get to identify when we fall short! We were in Los Angeles coaching some executives and after several long days of intense work, we arrived at our hotel near the airport for an early morning flight out the next day. I was tired and not in a very resourceful state. Without even greeting the hotel clerk, I walked up to the check-in desk and asked, “Could you please give me a room that’s not on the noisy side of the hotel and that’s not near the elevator?” Immediately, the clerk’s countenance dropped. Her breathing shifted to shallow levels and her body tensed up. My associate walked up and could tell the clerk was upset. He quickly asked, “What’s going on?” The clerk responded, “She just told me fifty things she doesn’t want!” My two requests were stated in the negative, causing the clerk to perceive 50 problems! My words had activated negative hormones and caused her stress and discomfort. I immediately knew that I had messed up. So, I quickly said, “I am SO sorry! Please let me start all over! Hi, it’s good to see you this evening and I am wondering if you could help me get a room on the quiet, courtyard side of the hotel and far away from the elevators?” She smiled, breathed a sigh of relief and the tenseness left her body. She replied, “Now, I can help you with that request.” Words matter. Word choices either make things harder or easier to understand. 4. Positive words are not always the best choice! There are times when negative words are the best choice to convey your messages. They do have a powerful impact and should be used strategically to get people’s full attention. But, too many negative words can kill motivation and hamper moving on to much needed solutions. One of my favorite presuppositions is: “Energy flows where attention goes.” When your goal is to bring full attention to a problem, then negative words should be used. Just use them sparingly and with purpose. 5. Carefully consider the consequences – I am uncertain if NASA understood the impact of attaching negative words to their brand when they adopted the tagline, “Failure is not an option.” Every time I see a t-shirt or bumper sticker with this NASA tagline, I think of the two space shuttles breaking apart and the tragic loss of life in both incidents. I had assumed an ad agency sold NASA on this tagline, but discovered it was actually created by a couple of Hollywood writers in preparation for the Apollo 13 movie. Afterwards, NASA started using this tagline on all kinds of NASA-related paraphernalia. It is the ultimate “pin the donkey” that attaches the negative word “failure” to the NASA brand. You are the director of attention! The words you choose should direct the attention of your listeners towards your intended goals. Negative words play a very important role in communications, but they should be used strategically and with purpose. Remember, you are the director of attention when you communicate, and by using more positive words than negative ones, you can improve how you influence others and motivate them toward goals. Our team provides award-winning soft skills strategies to help Fortune 500 groups achieve their business goals. We provide consulting, coaching and training services in these areas: leadership development, communication / soft skills, reputation management, media skills, stakeholder engagement and storytelling / presentations. Benchmark has consulted with and trained leaders and associates from all 50 USA states and more than 25 countries.